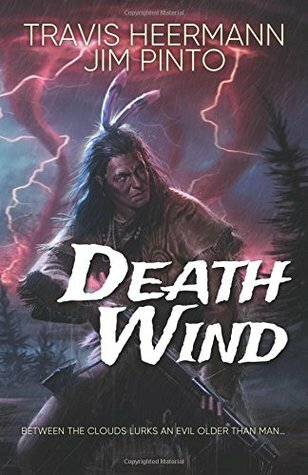 Death Wind, by Travis Heermann and Jim Pinto, is a horrifying novel about a powerful hatred that will gleefully destroy whatever you hold dear. The book is separated into three parts. The first part introduces Charles Zimmerman, a doctor who recently lost his two daughters to a deadly disease. Meanwhile, Oliver McCoy had just survived a strange attack, in which his friend decided to slaughter his comrades. In the second part, a supernatural pandemic has spread throughout the lands, carelessly decimating whomever comes into contact with it. This pandemic has been given the name of a malevolent spirit that takes over weak humans, and intensifies their hate until they are only shadows of what they once were. In the third and final part, Charles must face this evil, in spite of the disgusting tension between the settlers and the natives. In a thrilling novel that details the grotesque threads humans have woven into history, Heerman and Pinto skillfully illustrate what happens when hatred goes unchecked. I loved Charles, because he was a realistic character I could relate to. I commiserated with him when he lost his daughters, as well as his failing marriage. Though he tries to be a good doctor, he can’t seem to grasp his own inability to understand either community, and only seems to start grasping things only after everything is destroyed. Then there’s Little Elk, who had to rely on the settlers to try and find the missing children. Like Charles, she tries to find a balance between her life with the settlers and her native one. She grew up attending a Christian school, but she ultimately decided to follow the ways of her ancestors. She tries to be the voice of reason, but, much to my dismay, she ended up being consumed by that malevolent spirit. Blinding hatred was an overarching theme of the book. From the Black Wind, a wind that preys on the weaknesses of men, to the seething rage between the settlers and the natives, to even the bitterness of a once joyful family, both authors already foster the environments for such a demonic entity to take over. The aftermath of the Battle of Wounded Knee, as well as the haunting attributes of the Ghost Dance, also contributed to the fostering of this spirit. This detail was well-executed in the book, and one that I found the most enjoyable. From the rotating points-of-views between the two sides, to the dark entity lurking between the them, this book is a demented work of literary art that shows what happens when humanity succumbs to its vices. What’s more, the book lends itself to history, all the while presenting itself in the most gruesome way possible. Because of this, I would give this book a rating of a 4.5 out of 5 stars, and would recommend this book to fans of the supernatural genre in general.